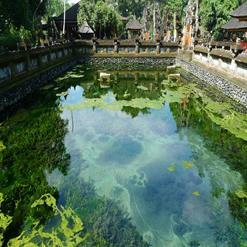 It is situated at Tampaksiring (18 km northeast from Ubud). Reached by climbing down 371 steps, the location at the bottom of a steep valley lined with paddy fields, is quite stunning. The smaller complex on the south side of the river is presumed to have been built for the King's wives, while the larger complex is thought to have been the residence of the King himself, and perhaps his concubines. The structures are carved into the sides of a steep river valley, and the river crossed by twisting trees and vines. You must take off your shoes before entering into the central pura complex.